St. Teresa's Academy's Ellie Bichelemeyer has become a force to be reckoned with. KANSAS CITY, Mo. — St. Teresa's Academy's senior volleyball star Ellie Bichelmeyer has become one of the top players in Kansas City. But, her meteoric rise is due to lots of hard work and effort throughout her high school career. "Club [volleyball] goes almost year round as well as high school. So, I'm always in the gym, always working out," Bichelmeyer said. "I think that's really helped me to get where I am today." Ellie's statistical numbers have been stellar this year. As of the start of this week, she's averaged a stellar 3.8 kills, 0.7 blocks and 1.5 digs per set. She has 212 kills for the season and has helped St. Teresa's Academy become the number two overall team in the state of Missouri. Additionally, she's helped the team achieve an 18-6 record and win 13 straight all while having the toughest strength of schedule in Missouri with a 22.5 rating. St. Teresa's volleyball head coach Lauren Brentlinger said Ellie has been a big part of their success. "She's just a really versatile player. We take advantage of her [services] in the front row, in all three positions out of servicing and out of transition," Brentlinger said. "She plays indoor and beach volleyball. So, that just makes her a very good ball control player. And, again [she's] just a versatile player. So, we take advantage of her [services] in that aspect." Ellie has committed to play college volleyball at Rice University next fall. So, her career will continue beyond high school. However, she still has unfinished business as it pertains to her time with her current team. She and her teammates would like to win a state championship. But, Ellie knows that will take continued hard work and effort. "We knew going into this season that we had a target on our back. We've gone to state the past three years. People wanna beat us. And, we are a team that has been talked about in the city," Bichelmeyer said. "Now, we just have to go out there every game, be focused, put in the work, and yeah, give it our best shot every game we have." 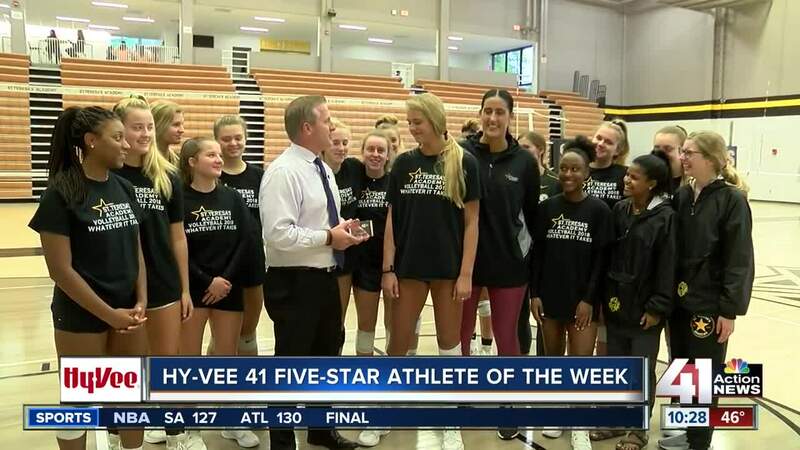 NOTE: The Hy-Vee 41 Five-Star Athlete of the Week segment airs every Wednesday night during the 10 p.m. sportscast for the entire school year.